Looking for set of quality steak knives that doesn't cost a fortune? Whether you are shopping for your own kitchen or looking for a gift idea, these professional-grade knives from Viking Culinary are a great option to consider. 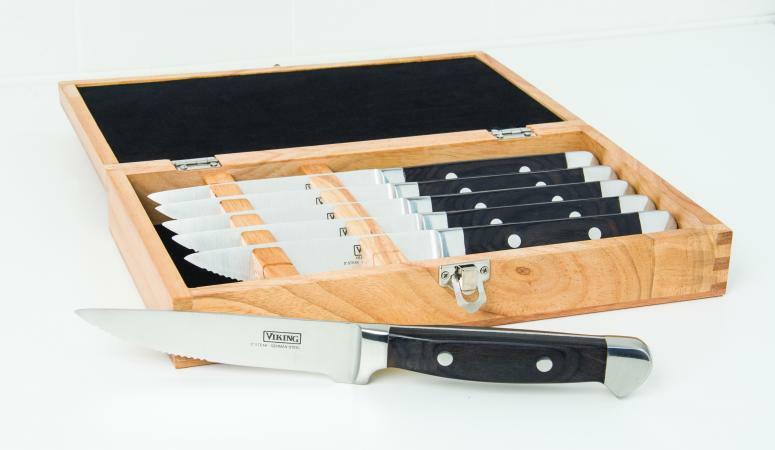 Available from retailers like Amazon and Cutlery and More for under $100, the Viking Professional Steakhouse Style Knife Set is a great choice for any home kitchen. 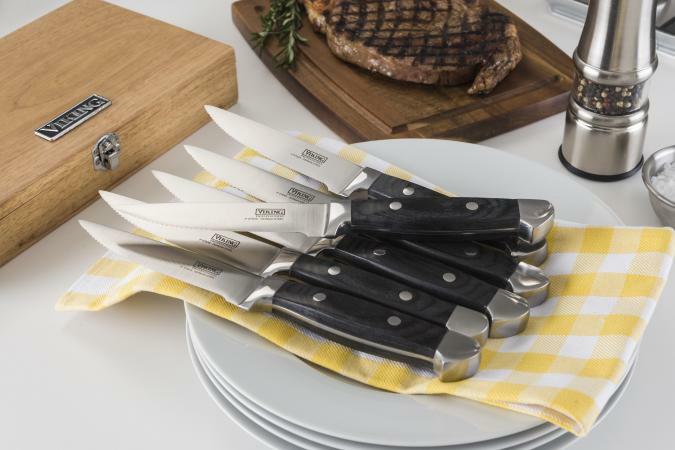 The set consists of six high quality steak knives, each of which has a five-inch partially serrated blade. The full-tang blades are made from strong, long-lasting 18/10 Germain stainless steel. The blades are double-riveted inside sturdy and beautiful handles made of Pakkawood. While these knives are truly beautiful, their appearance is not their only appeal. These are sturdy restaurant-grade knives designed to provide a high level of performance at a great value. The handles are comfortable to hold and balanced for easy chopping, and the blades do a great job cutting through a wide variety of food items, from super-thick steaks to thin boneless chicken breasts and more. These knives are also beautifully presented, as they are shipped inside a lovely gift box crafted of bamboo. They would make a perfect gift for a wide variety of occasions, including weddings, housewarming parties, birthdays, holiday occasions, and more. The gift box is serviceable in addition to being beautiful, as you can use it to store the knives when they are not in use. Note: The author received a sample set of these knives for review purposes. The opinions shared here are her own.